Books for sale at evening presentation. The Great Plains seems to be a beautiful place—a place of big skies, great distances and cows. Beware the cows. A city kid from Buffalo, New York, Ken Ilgunas set out in fall several years ago to walk the route of the Keystone Pipeline, planned to go from Alberta to Texas. His purpose was to write a book about the land the controversial project would cross. At the evening speech, in the light. But his worry, besides being shot for trespassing as he followed the route, was the potential for cattle catastrophe. Although he did have some scary encounters, cows, it turned out, where not the bad. And the people he met were mostly willing to help a scruffy looking stranger walking across their land. Ilguan, who spoke March 5 at Mount Mercy University, told both a journalism class and an evening public program that he had a particular approach to strangers. MMU Director of Sustainability Rachael Murtaugh introduces Ken Ilgunas to class. Ken Ilgunas speaks to class. Ken Ilgunas at evening presentation. The answer was almost universally “yes.” One-on-one, as it turns out, Americans are not hostile or violent. They’ll invite you in, give you water, sometimes offer a meal or even a couch for the night. I enjoyed both of Ilguna’s presentations, and hope to get and read his books—I did not have enough cash in my pocket to buy one tonight, but I’ll shop for “Trespassing Across America” soon. Besides being an interesting and entertaining personal journey, Ilguna was also recording what he called, in scope, one of the biggest of all human-made environmental disasters, second perhaps only to global warming. Great swaths of land in Canada are being stripped to get at the oil tar, and great damage is then done to extract the oil from the sand and clay it is bound to. The afternoon session, in which a social work professor kindly allowed my introduction to journalism class to sit in, included some interesting thoughts on launching a writing career. 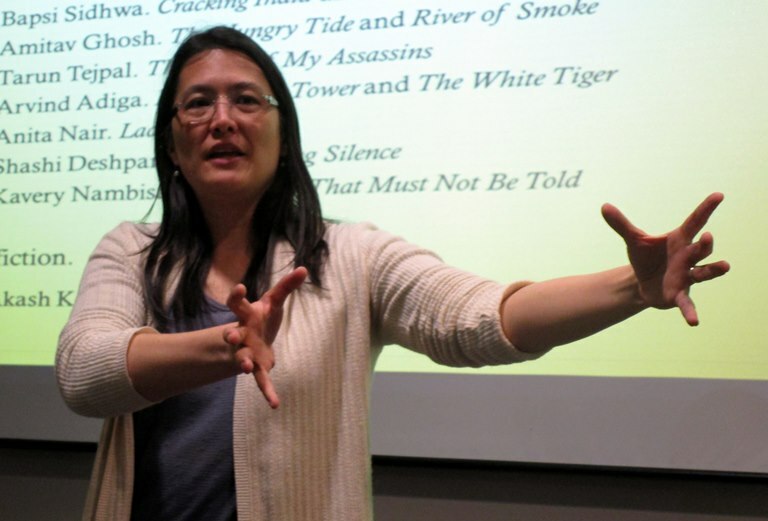 Among other things, Ilguna urged students to have their own web site—which validates a requirement I made in my writing classes for students to do that very thing. The class also included an interesting discussion of the reality that Ilguna was a white man walking across the whitest part of North America, which was to his advantage. He and the students speculated it would be harder for any person or color, and several women noted that it would be difficult for a female to make that kind of solo journey. It was an interesting day. 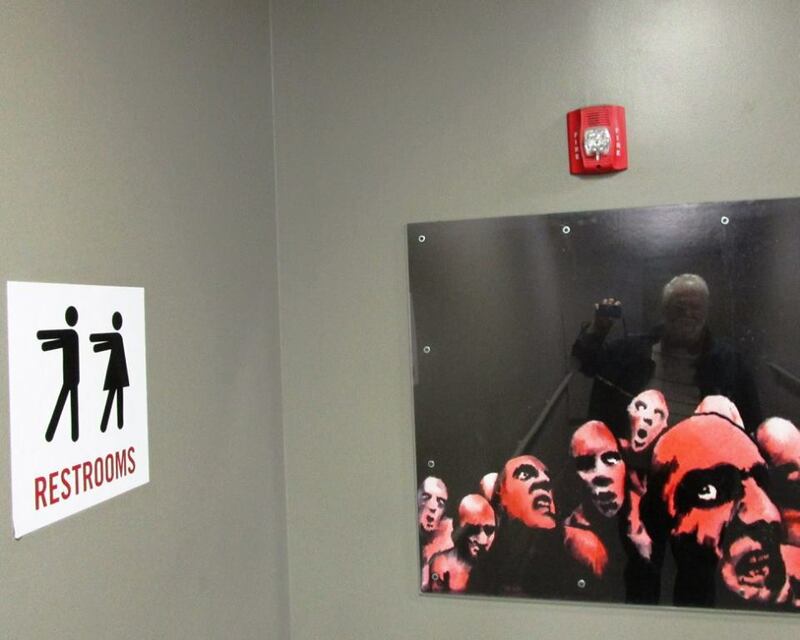 More images. I’m glad Rachel Murtaugh and the MMU sustainability effort brought this interesting writer to campus. Daffodils blooming and Albert Memorial in background in Hyde Park, London, March 23, 2018. I like visiting large cities. The museums and shops of Minneapolis, St. Louis, Kansas City, Chicago, Seattle, San Francisco, New Orleans, Vancouver—I’ve been there and would willingly go back. New York City is prominent on my list of places I want to go, and if you’re planning a trip to D.C. any time, I would love to be with you. In particular, I hope to get back to San Francisco. But though I love all the cities on my continent, London seems like a special place. It’s so steeped in the world—more of an international crossroads than any American city. It bears the marks of its sometimes volatile, violent history. It seems a bit cleaner than many North American metros. Despite its vast size—London is a huge, sprawling city—it is also human in scale, with narrow walkways, bike paths and streets. It’s a city of glittering, ugly new skyscrapers. But in other areas, the buildings are only 4 or 5 stories high—creating a crowded cityscape that is nonetheless more light and airy than many central urban areas. We were lucky this year to spend spring break in England. Friday was our full day in London. We arrived Thursday and depart Saturday, and I am thrillingly awaiting my first visit to the British Museum today. Thursday was the Science Museum, an accidental stroll through Imperial College, Hyde Park and a pretentious museum in the Greenwich neighborhood that was actually a extensive advertisement for how self-consciously cool the real estate in the Greenwich Peninsula is. The underground is loud and crowded and smells of oil and age, and I love it. As my wife and two granddaughters were on our own for the morning, my son-in-law had specified the route—take the Jubilee Line to Green Park, and switch there to the Victoria Line for the tube to South Kensington Station. I was a little paranoid about riding the wrong way, but as Audrey pointed out, if that happens you just hop off the train and take one headed the other way. The Science Museum, when we got there, was crowded and noisy. I spent my time chasing after grandchildren rather than strolling through the technology exhibits, which would have been my choice. Still, playing with grandchildren is a pleasant way to while away a morning, and it was a prelude to a glorious afternoon. March in Iowa is a transition month, a mix of winter and spring that will bring 10 inches of snow today. While England saw a rare snowfall earlier in March, and the weather has been cool, it’s still very much spring here, with flowers in bloom and green grass, even if the trees have not yet woken from winter slumber. Friday afternoon was strolling in Hyde Park. If I came here with just adults, I would be tempted to rent bicycles to see more of the park, but what I did experience on a pretty spring afternoon convinces me that one of the glories of Britain, besides the Beatles and Monty Python, is parks. Their playgrounds tend to be wood and metal and sturdy and old-fashioned, with swings and teeter totters and dangerous things that would not ever be built today in North America, where playgrounds are plastic and padded and safe and dull by comparison. The day was also filled with food. We had lunch at a quick food shop that defies description. With its rice base and spices, I considered it Asian, but my son-in-law says it was a French fusion place. Whatever. It was filling and good and definitely not McDonalds. And when we grew tired in the afternoon and had the early rush hour Underground journey back to our temporary apartment by the Thames, there was a stop for sticky toffee pudding. If you haven’t, perhaps the expense and time of a flight to London is worth your while to experience that dessert. I liked it, although, in full disclosure, I know from personal experience that my daughter and son-in-law can whip up an even tastier version of this treat. The Brits don’t have a great reputation for culinary genius, but in my experience, eating in England features delightful dining. True, they invented beans on toast as a meal, but they also created fish and chips and sticky toffee pudding. Well, God save the Queen and all of her subjects. I visited a pub in Norwich earlier this week and hoisted several pints. Cheers to England and to London, which right now is about my favorite city in all the world. Of course, my opinion may be tainted. We’ve been hosted by my delightful oldest daughter and her family. There are two active, bouncy girls to play with and a baby boy to cuddle. That and Hyde Park—what more can one ask of a great city? Cloudy day–on a county highway south of Lisbon. The weather slowly improved and it didn’t rain, so clouds just added a bit of interest. I didn’t mind AC, but it would have been cool enough for an old school, windows down, drive, too. It happened on Highway 1, south of Mount Vernon, Saturday, Aug. 27. I was driving at probably close to 60 mph (I know, the speed limit is 55, I wasn’t that far over), when suddenly, to my right, a bright orange butterfly came flitting towards the path of my van. If it had gone too far, I would have smacked right into it—neither my life nor the lives of my passengers were worth endangering over a butterfly—but I would have felt bad. Luckily, it appeared said Monarch zigged instead of zagged and eluded the Kia of death. Such was the drama of my Saturday drive. The drive itself was a spontaneous event—the 8-month-old grandson who is staying with us has had an ear infection and may be teething and today was a bit cranky at times. He didn’t sleep well last night, and was acting tired late in the morning, but would not go to sleep. So, Audrey and I tried an old-fashioned family remedy—the drive. You strap the cranky baby in his car seat, put it in a vehicle and head out. It worked rather well. As I headed north out of Cedar Rapids on the C Avenue Extension, the baby slowly sacked out. And so, we just went for a drive. It felt very 1960s. When I was young, especially between 1966 and 1972 when we lived in Clinton, Iowa, the weekend “drive” was not a rare event—the family would pile in the car and head out to see what we could see, no particular destination in mind. The car, back then, was a chartreuse VW microbus named Clarissa. At least for the early years, it was—although, after a brief interlude owning a Ford station wagon, it wasn’t long after Clarissa’s demise that my parents brought a shiny new 1969 VW microbus. The “drive” was a bit different, now. Our Kia minivan today has air conditioning, for one thing, so we sojourn with windows closed. A Saturday or Sunday drive in Clarissa was windier—no AC, so windows open—and also much noisier not just because of the wind, but because the small 4-cylinder German engine in the VW squeaked and thumped like an angry sewing machine. We didn’t use the radio much back then, although today we had an oldies station on. Sutliff Bridge. You can walk on it, but we did not because the baby was asleep, which was kind of the point, anyway. Besides the fact that I was driving, and not my dad, another difference was bugs. Anytime we went out in the countryside for a drive in the old days, the VW bus front and windshield collected quite a coating of insects. Today, we weren’t responsible for anywhere near the bug carnage. I know it’s anecdotal—there is no careful measurement to check the accuracy of the impression—but an Iowa drive today is almost eerie for how less buggy is seems than a drive a few decades ago. Our weekend drives, usually Sunday evenings, ended, for the most part, about the time that the family moved to Muscatine. Life became busier and more complex as the Sheller kids became teens and adults, and gas prices in the 1970s put an end to most pleasure cruising. But today’s drive was a pleasant reminder of that bygone pastime. We meandered across part of northern Linn County—finding to our surprise that the village of Lafayette is actually a thing—there is more “there” there than one sees simply passing by on the Cedar Valley Nature Trail—and eastern Linn County near Mount Vernon is hilly and pretty. We went south of Lisbon and ended up in northern Johnson County at the old Sutliff Bridge. We’ll have to come back there and walk the bridge, sometime when the baby is awake and the place is not quite so overrun with motorcycle bar patrons. It was kind of fun to drive, for a bit, on the route that I had ridden on RAGBRAI last year. Jesus—did I really bike some of those hills in rain? Anyway, I don’t think we’ll be regular “drive” enthusiasts. The time of the Sunday drive as a carefree family fun activity is an artifact of a time when gas was under $1 a gallon and global warming not such a hot issue. Pleasant as today’s drive was, I would rather see the countryside from a bicycle seat. But I don’t think the bike is quite as good for soothing an uncomfortable baby. On the way home, the baby woke up, in a pretty good mood. Grandma was riding in a middle seat beside him, and put a pillow on her head. “Look at my hat,” she said, and then the pillow slid off. The baby thought that was hilarious and chortled. So, my wife did it again, and again, and again. No, I didn’t really tire of the joke, because it kept being funny for the baby. Such is the entertainment on a weekend drive. Stopped at light on Highway 100 near home. A few more patches of blue in sky. Pillow has probably just slipped off of her head. Sound of baby laughing. 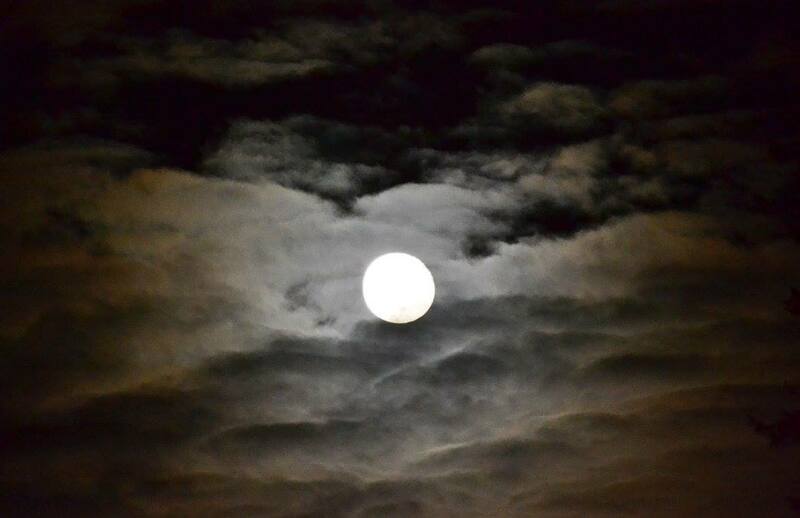 Wednesday night moon after PTSD talk. Wednesday and Thursday nights were both interesting for me, and featured very contrasting, interesting experiences. 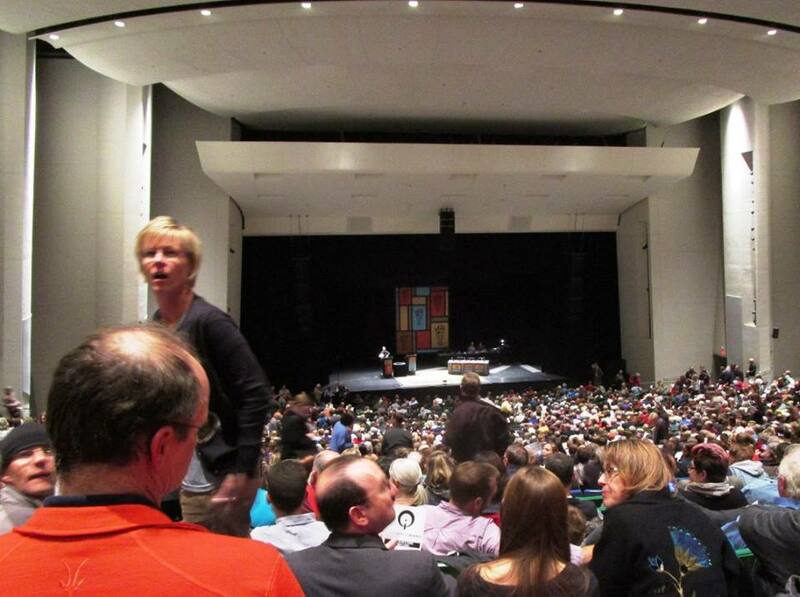 On Thursday, my daughter, wife and I drove in the afternoon to Des Moines to watch a recording of the NPR radio program “Wait Wait… Don’t Tell Me.” Usually recorded in Chicago, the show made its first stop in Iowa and was taped at the Des Moines Civic Center. We were lucky to get tickets. When they announced the show was coming, my wife was quickly on the internet. First she ordered two, and later that day when she wanted a third, there was already no way to get adjacent ones. The event was quickly selling out. But we did get three seats, in the same row (near the back). Two were adjacent and one was rather far away. I sat alone so my daughter and wife could enjoy some time together, but I don’t mind. It was still fun for all. I don’t know exactly what I was expecting from the program. I’m a fan of the radio show and listen to it regularly, but I wasn’t sure what it would be like to “watch” a radio show being recorded. Well, it was just lovely. I was way, way back in a very large auditorium, so I could only see the people rather vaguely at a distance, but the sound system in the civic center is great, and it was both entertaining and fascinating to observe as radio magic was made. Host Peter Sagal was clever and amusing. I don’t know if you’re a fan of his, but I liked his banter. He did ask at the beginning if any presidential candidates were present, and when none were, noted that in Iowa these days, that made the Thursday night gathering unusual. The GOP also should get a “thank you” card from Wait Wait, as the Republicans as a horde of clowns and their freak show of a debate this week provided much of the topical humor. 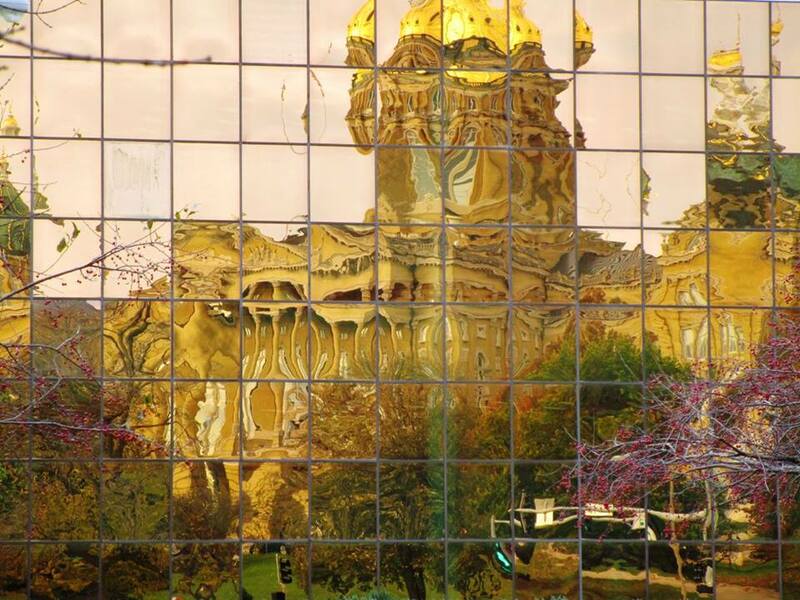 Capitol reflected in state office building–went to Capitol before the show. It’s now 24 hours later, and I’m drawing a blank on what most of the memorable lines were. However, a remark Sagal made about Jeb Bush comes to mind—about how, after the CNBC debate, reporters didn’t question Jeb, they just stuck toothpicks in him. And all of them came out clean. In particular, I don’t recall details of what Roxanne Roberts said, but I have the distinct impression that of all the panelists, I would rather feed and house her during a blizzard than any others. And no, I don’t intend any double entendre or even single entendre—she just seemed like a person you wouldn’t mind playing endless rounds of Bananagrams with, chatting with until the snow plows come. Peter was in good form. Tom Bodett was also good, although he could not tell the difference between “Ottumwa” and “Altoona.” Then again, he was relating a 40-year-old story and a fake news item featuring Ottumwa had been read, so I guess we’ll just gloss over the Iowa geography lesson. Luke Burbank was funny, too, even if, like Tom, he wasn’t quite Roxanne. Something was going on with Luke that I don’t understand, and even 10 seconds of intense Google research (as in, typing “why did Iowans boo Luke Burbank?”) didn’t yield an answer. He got hearty boos at several points—what did I miss? I was way up in the cheap seats, sure, but I didn’t hear him say anything that an Iowan would boo. Did something notorious happen in Des Moines yesterday that I don’t know about? Did he do something unspeakable and outrageous like try to put a bra on our Civil War memorial or diss a corn dog? I don’t know, it’s just a mystery. Anyway, the show began with a cute use of disco style lights and a warm up by Sagal, and then we were off. You’ll have to listen Saturday (or to the rebroadcast Sunday), but I for sure will tune in. It’s at 10 a.m., and the station here in Cedar Rapids is 90.9 FM. After all, the audience can be heard clapping and cheering at several points, so listen to hear the sound of my hands. I don’t know if they will edit out the booing, but no matter, don’t bother to listen to it, I didn’t have any reason to, so I didn’t boo. Sagal said that it was the first time in 18 years that the show had been in Iowa. I didn’t realize that, and am really glad that Audrey jumped on it and got tickets. At Capitol, getting first-lady fashion advice. I know it’s a nerdy thing, I but I do like dropping by the Capitol. We got in town a bit early, so spent an hour there. So much that is in the Capitol is both cool and strange at the same time. 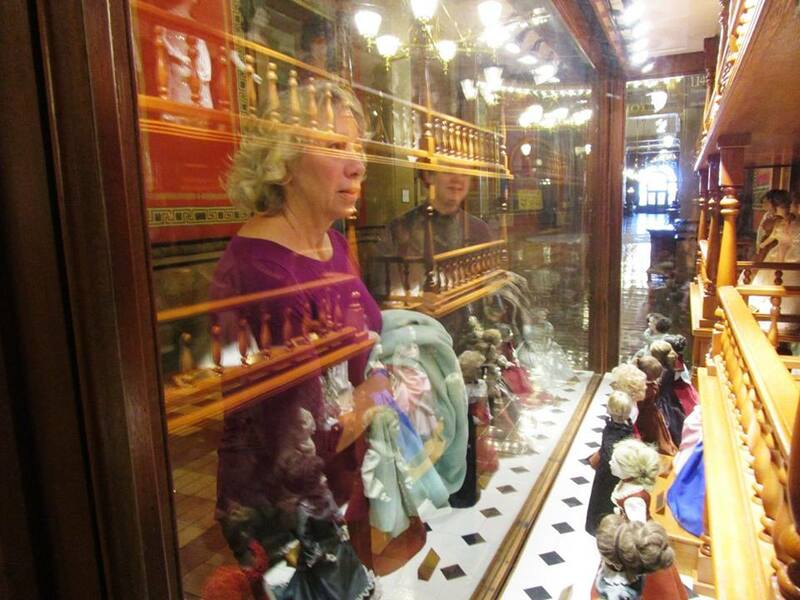 Like the doll display of gowns worn by first ladies of Iowa. Huh? And why is Lincoln reading to Tad such an important historic moment that it’s preserved by the entrance? I mean, cute, but what? We could not help ourselves so we did it. We thought briefly about branching out—there are other places to eat in Des Moines after all—but really, we were at the Capitol and between us and the Civic Center temptation loomed too large to ignore. Those of you that know Iowa eateries, be jealous. Zombie Burgers. Every time I’m in an auditorium, I find myself picking out attributes I would like to include in the new MMU Fine Arts Center. Not an auditorium the size of the Civic Center—something maybe about a third of that size—but still, we sure could use a nice auditorium with some Fine Arts facilities attached to it. If you want to know where to blow millions of dollars, I’ve given you a hint! We saw some random Cedar Rapids people there—a neighbor from our neck of the woods for one, a ringer from the MMU hand bells for another. Iowa’s second city had several reps besides the Shellers. One aspect of watching a radio show that I found fun was watching the quick second takes, and the “corrections” at the end. It took a bit more than two hours to record the audio for less than an hour of radio time, and it will be funny Saturday to listen for what was left out. You all tune in Saturday. That was Thursday night. Wednesday was also a good night, in a completely different sense. 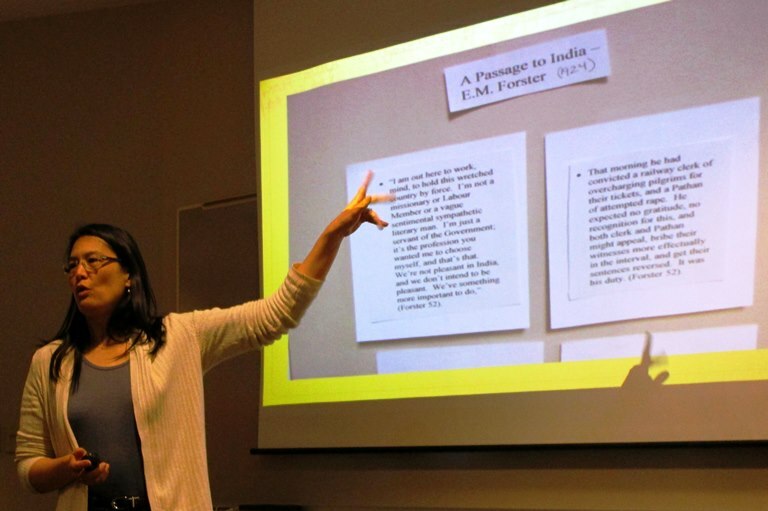 A professor emeritus of psychology and a graduate student working in counseling at Mount Mercy spoke as part of our ongoing Vietnam series. 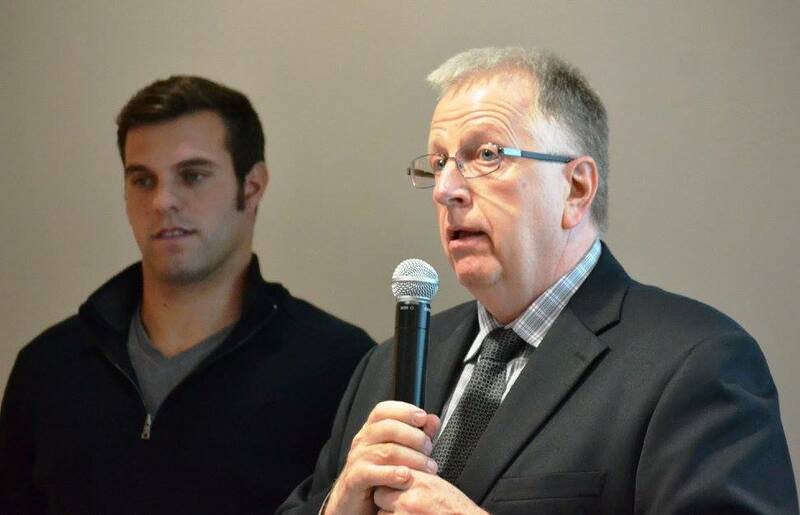 Dr. Don Damsteegt did most of the speaking, but Travis Guy has some interesting additions. They told the stories of five different Vietnam veterans who suffer from PTSD, and then Don took us through some of the history and treatments for the disorder, which was first diagnosed in the wake of the Vietnam War. I felt that I learned a lot. I am close to some people who have suffered traumatic stress, and I think the evening was a good eye opener. In particular, Dr. Damsteegt talked about the neurological changes brought on by this kind of stress—a good reminder to those of us lucky enough to not have suffered traumatic stress that those who have PTSD are not malingering or failing to “get over it.” Their brains have been rewired and their way of thinking and perception of the world has been altered in fundamental ways. Not that there is “no hope.” In fact, there appears to be effective treatments for many who suffer PTSD—but it’s important to remember that it’s a condition that requires both time and professional help to cope with. And as both Dr. Damsteegt and Guy noted, you don’t “get over” PTSD. You learn to cope with the new way your brain is wired. Anyway, Vietnam vets, especially combat veterans, certainly have a high incidence of PTSD. And during a question-and-answer sessions at the end of the presentation, an audience member asked what those of us who know a person suffering from PTSD can do to help. Common style of cap worn at these events–this is the man who made the poignant comment. 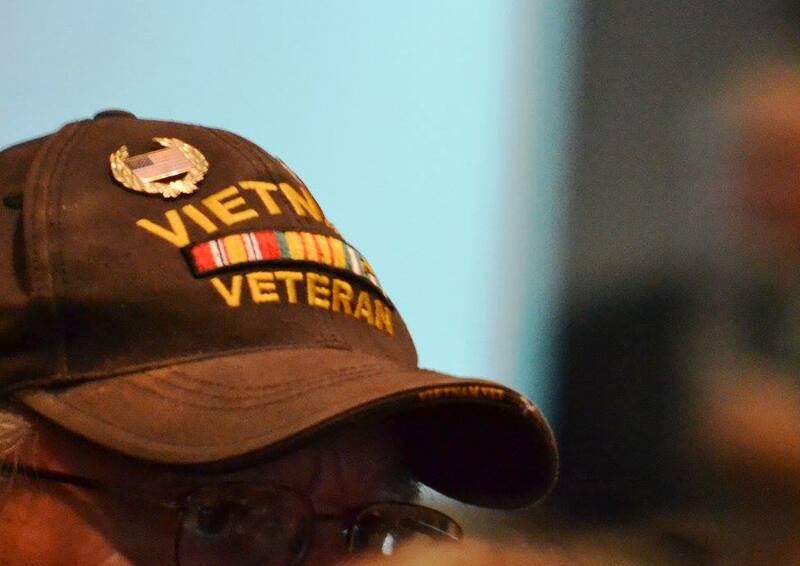 An old gentlemen, wearing a “Vietnam Veteran” cap, raised his hand. “Just listen to his story,” he said, his voice catching as he spoke. “That is an excellent answer,” Dr. Damgseegt said. As I said, Wednesday and Thursday certainly contrasted, but it has been a fascinating week! 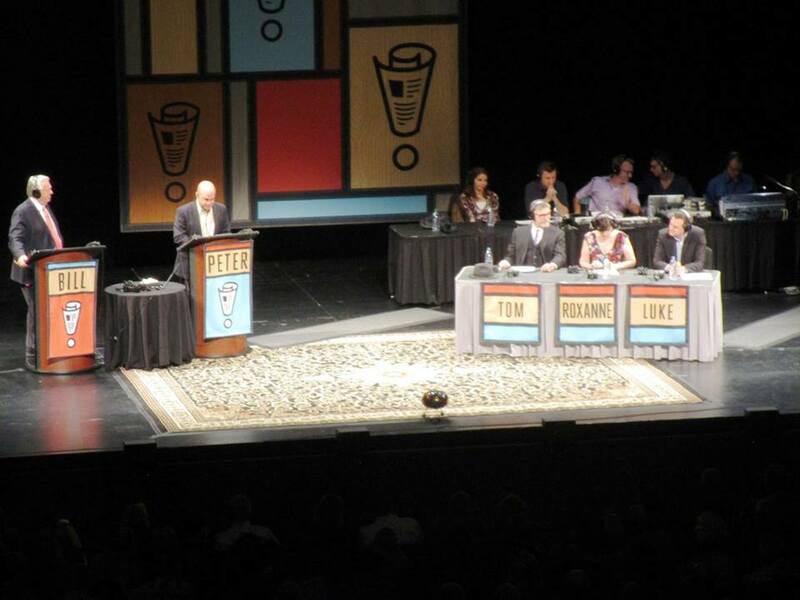 More image: photo tweetted by WaitWait, images from Des Moines Register and my PTSD and Des Moines pictures. 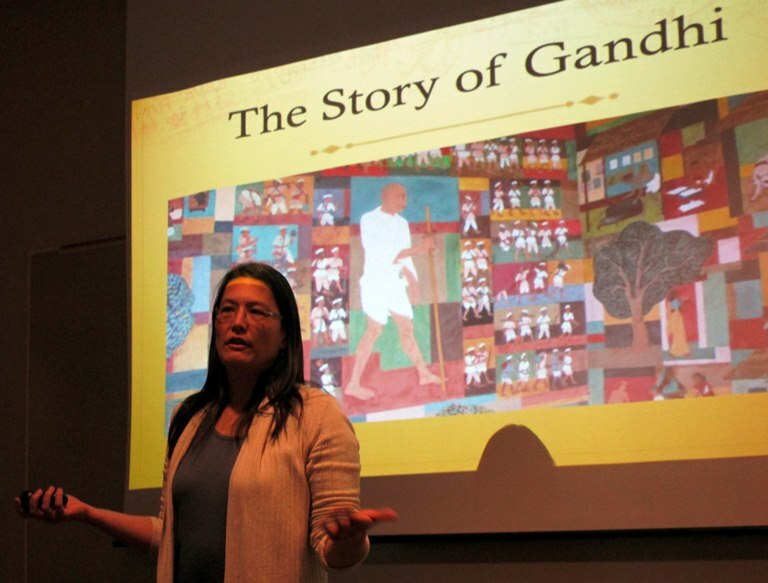 Dr. Joy Ochs describes her travels in India. Well, I suppose when you are there and the temperature is above 100 Fahrenheit and the humidity is high, summer in India must be sweltering. Still, it was pleasant on this cold Iowa night to listen to Dr. Joy Ochs talk about India. I took a few notes during her speech, and promptly left them in my office, so I’m flying without a net here and hope I don’t garble too many details. It probably doesn’t help that I had to push to finish writing an exam after seeing the speech and before tackling this blog post—there is nothing like making test questions to erase newly formed neural connections. Quoting British writers on India. They all thought British culture was better than Indian culture, one reason Dr. Ochs sought out Indian writers to read. Anyway, I was impressed with many of the things I saw and heard, even if my memories are a bit fragmentary. The pictures she showed were stunning—I really liked the details of some of the architecture. The important environmental work done by some NGOs was also good to hear about. One point of the speech that stood out to me was Dr. Ochs recounting her desire to find Indian writers to read in order to understand India better. I guess I like the idea of finding the voices of another culture to speak for themselves. In fact, she will teach a course next year on Indian literature written by Indians. You all should take it, MMU students. Well, I won’t have time to enroll in the class myself, which is a pity. India seems like a fascinating, complex—and, most alluring to an Iowan today—warm place. Pictures that tell the story of Gandhi. The Indians seem to tell lots of stories visually, and it would be cool to be in that warm place to see them. Especially today.